Last night I had the pleasure of participating in an event called "A Social Web Sampler," produced by Philly NetSquared. If you're not familiar with NetSquared (or NetTuesday as the events are sometimes called) it's a group that brings together people working in technology and social media, with and for non-profits. Last nights event was designed to expose participants to a variety of social networking tools -- standards like Facebook and Twitter, and a few newcomers like FourSquare. Something I appreciate about Philly's NetTuesday events is how incredibly interactive they are. And I'm not talking about people sitting in the audience raising their hands to ask questions. Last night for example, there were five "stations" spread around the room, and 3 "sessions" of 15 minutes each. (See chart) At each station was a computer and a group leader, with an appointed topic. At the start of each session, participants moved to the table of the topic that interested them. The group leader was not responsible for any lengthy prepared presentation, but rather simply to facilitate a conversation around that topic. I led a session on content management systems, and we had a nice gathering of folks interested in different systems. We talked about the differences between installed and hosted software, and how WordPress and now Drupal are available as the identical software in either installed or hosted form (see Drupal Gardens for hosted Drupal). We ran through some common and less-common modules for Drupal that I happen to like using, and we discussed Joomla and its lack of noticeable presence in Philadelphia. 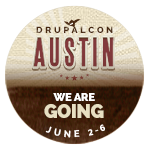 Of course I had to put in a plug for folks interested in Drupal to attend Drupaldelphia which is coming up next week. If you're involved in running tech or networking events and you're looking for ways to get people talking more and up the level of interactivity, I'd definitely consider this kind of rotating small-group event. Once you get people over the idea that to lead a group they have to be an expert and put a lot of time into preparation, people are generally willing to step forward and share.